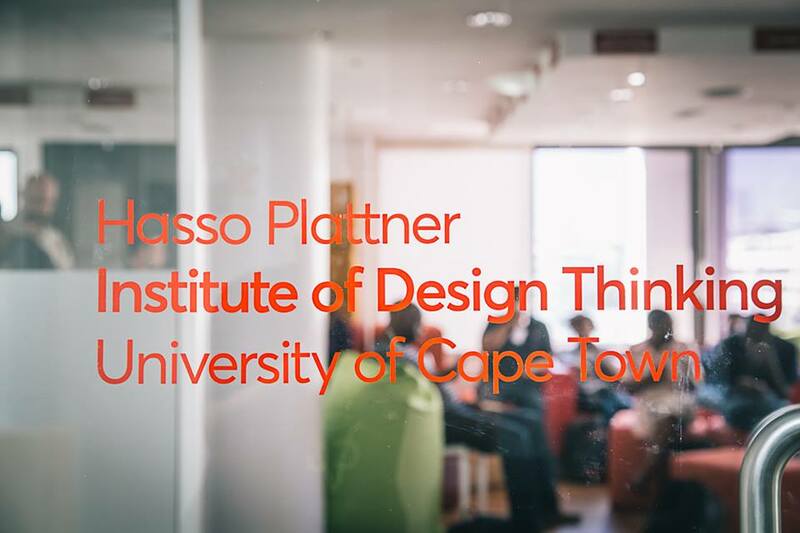 Written for UCT students interested in doing a design thinking course at its new d-school. 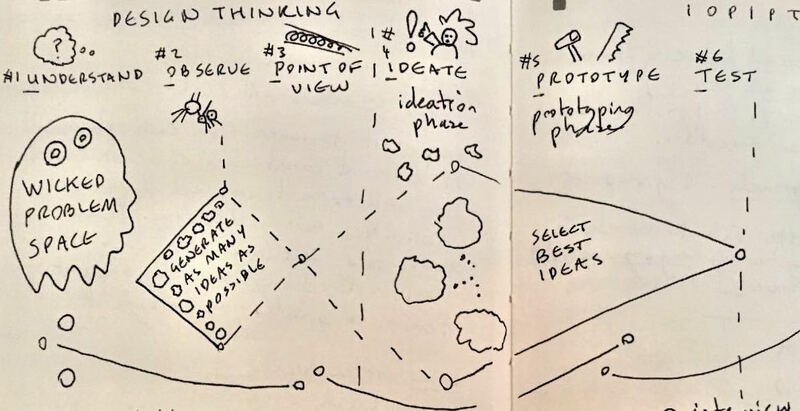 Design thinking is a creative methodology based around 'building up' and integrating conflicting ideas and constraints to create new solutions to problems. In Tim Brown's talk, Designers -- Think Big!, he argues that the broad concept of 'design' should be recovered from its modern understanding. This is as a narrow process that focuses on making objects more attractive, easier-to-use and more marketable. Such a highly-constrained, object-focussed understanding is shaped by consumerism's rise in the late 20th century. An unfortunate by-product of this restricted conception is that design becomes mostly unimportant due to its scope often being unambitious and its outputs quickly outdated. An earlier, grander understanding of design as catalysing breakthrough systems exists in stark contrast to its present use addressing the small screen issues of image, aesthetics and fashion. As society confronts new, pressing social problems, an opportunity has emerged for 'design thinking' to recover design's earlier, expansive meaning. Design thinking focuses on systems to create impact on big social challenges, such as universal access to quality education and improved healthcare. Ideally, design thinking supports designers in stretching the desirability, feasibility and viability of their solutions to the limit. 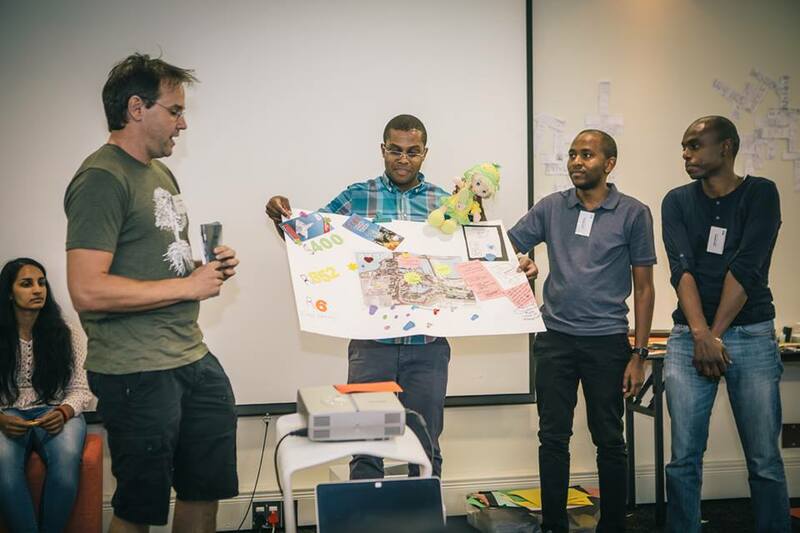 I was fortunate to participate in a local design thinking course at UCT. 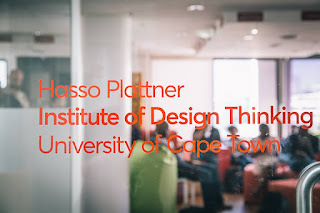 Its new d-school chapter of the Hasso Plattner Institute's design thinking school recently opened courtesy of the 'Beyond 2014 Legacy' project of Cape Town's World Design Capital 2014. UCT's d-school is part of UCT's strategy to become a research intensive university. Like the recent UCT upstarts initiative, the d-school is part of an innovation portfolio. This is intended to leverage the triple helix of academia, research and industry for driving innovation via inter-disciplinary approaches. Hopefully, it can emulate Potsdam's example, where 30 start-ups have emerged with its d-school's support since 2008. I was one of 30 post-graduate students in the d-school's free ten week pilot course at UCT's Graduate School of Business, which students typically pay 600 Euros to do. Cape Town's d.school will be formally launched towards the end of 2016, joining other chapters at Potsdam and Stanford University. Like both, Cape Town's will be unaffiliated to any particular faculty. 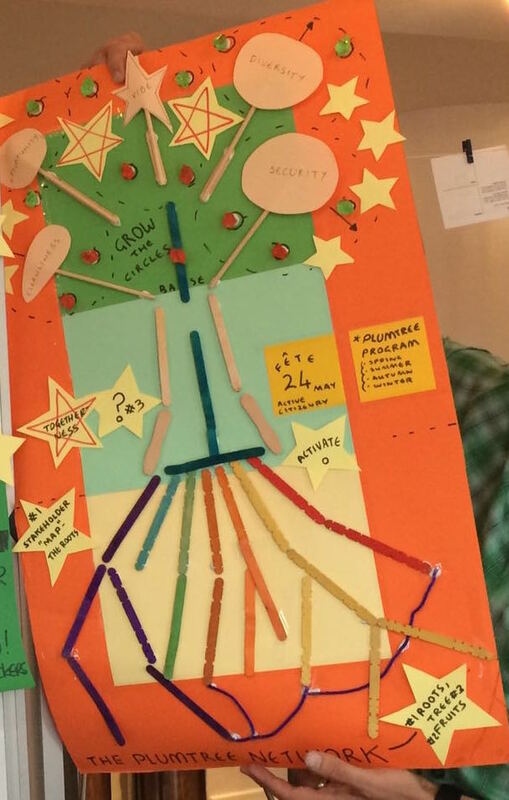 According to the d-school's founding director, Richard Perez, design thinking training’s basic tenets are collaboration, being human-centred, creative thinking and learning through doing. Each feature in the d-school's unusual style of pedagogy: students from varied academic backgrounds are placed in inter-disciplinary teams. These are introduced to concepts via talks and then spend a significant amount of their project time in the field. Each team is closely mentored by a coach in their custom studio space and out in public. Project four. Encourage the development of Plumstead's transport precinct to support the City of Cape Town's Transport Council's Transport Oriented Development Strategic Framework. This final project spanned seven weeks. 6 Testing the prototypes with stakeholders and communities. For project one, team 'Good Fellows' explored redesigning the Waterfront's entertainment experience. A key insight was that visitors (i.e. the Watershed) had suggestions on what else they would like to do (i.e. participate in African maker space activities), but had no easy way to make suggestions. In response, we proposed a system that encourages visitor's feedback. In project three, 'Team Not A Shuttle' learnt humility in what we might accomplish in four days in response to a wicked problem. To answer the challenge of improving the mobility experience for the V&A Waterfront's workers, we focused on their walk to and from Cape Town station. We proposed that interested staff be provided with sponsored, seasonal wear to protect them from the sun in Summer and rain and winds in Winter. 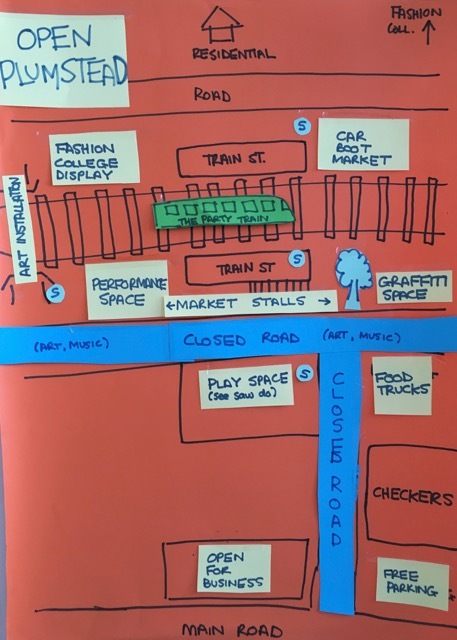 In project four, team 'Trains On Time' learnt that users of the Plumstead transport precinct want a safer and cleaner area before they will buy into further development. To promote an active citizenry that might address these needs, we proposed a 'Plum Tree Network'. 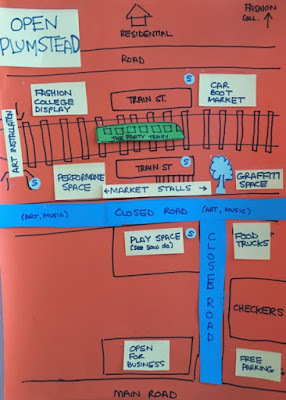 Our presentation to the Transport Council suggested that this network could organise a seasonal Open Plumstead festival. This would provide an opportunity for locals to work together for addressing the precinct's basics. In addition to being tutored by design thinkers during these projects, students also had the opportunity to attend presentations by Tim Brown (the originator of design thinking) of IDEO, Jocelyn Wyatt from ideo.org. Plus, we could also do a one-day workshop led by Stanford's d.global's Tania Anaisse on Freedom Day. As a designer and researcher my experiences of problem-solving have mostly been limited to small screens. By contrast to this largely linear experience, design thinking is highly iterative. 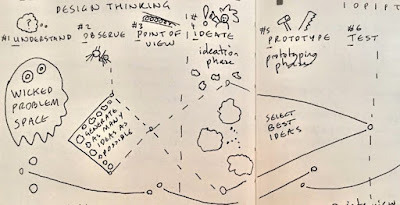 Learning to apply the design thinking methodology has helped me to be more critical of my working process. In particular, I need to include the target of any designs during the project, not merely after it. I should work with an inter-disciplinary team to refine the problem statement and proposed solutions. Their feedback should be used to develop integrated solutions and prototypes that can be experimented with as early as possible. I also hope to take the advanced design thinking course next year, which will be open to graduates of the ten week course. Each of its phases also offer different methods (or 'buckets'). This means one can still learn new methods while repeating the same phases. 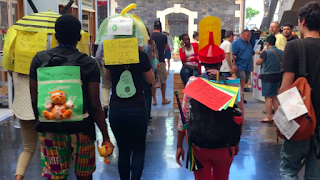 A student in any discipline can benefit from design thinking and I highly recommend the UCT d-school course to Fine Arts, Design, Media Studies and ICT for Development students. Most will benefit from learning its methodology, as it can support them in critiquing their projects, whilst stimulating alternate ideas and prototypes to test. P.S. For Facebook updates on the d-school, 'like' https://www.facebook.com/Cape-Town-d-school-179577095777354/.